[IBC18] Conference Cycle Program is available ! This year, Perfect Memory takes the podium ! 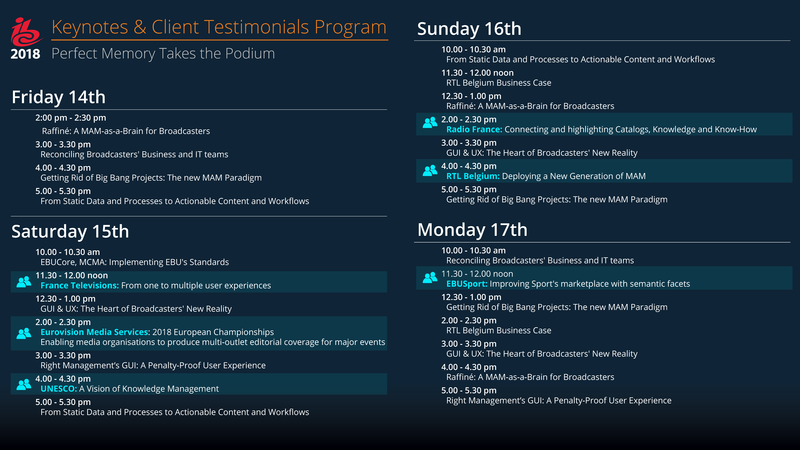 As our final annoucement before the IBC next friday, we are very happy to give you the Perfect Memory’s conference program for IBC2018 ! This year, we host 6 Client Testimonials and 8 Keynotes in our H8B36 booth to showcase our DAM-as-a-Brain ! An interactive Floor Plan was published on the IBC Web site, you can access to it by following this link. In order to wait until friday, let’s have another look on our conference cycle’s teaser here. Finally, feel free to use our Customer Code (19039) to get a visitor three-day-pass.